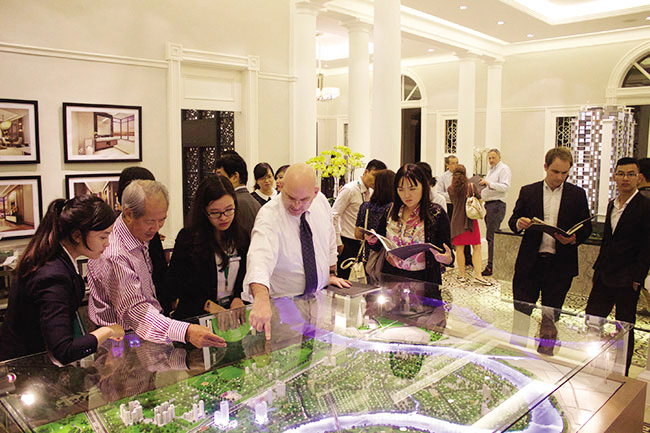 Although the Housing Law of 2014 created favorable conditions for foreigners to own houses here, buying a home is still no easy matter for foreigners given the legal complexity of the real estate sector in Vietnam. The following notes may be useful to foreigners thinking of getting on the residential property ladder. First, the buyer must be qualified under the applicable laws. According to the Housing Law, the condition is now so relaxed that a foreigner who lawfully enters Vietnam can be eligible to own residential housing. As such, the buyer needs to prove that his entrance is legally permitted. Second, it is advisable that the buyer should keep a track record for the money he brings to Vietnam for buying the house. This would make it easier for the buyer to remit the money back after selling the house at a later date. For this purpose, he should open an account at a bank in Vietnam to which the money will be transferred, and from which the payments for the house should be made. In case the money is his salary or income earned from working or doing business in Vietnam, he should keep documents that track his/her income. Third, the buyer should get to know which property projects that he or she is permitted or not permitted to buy in order to avoid future risks. Please note that foreign buyers are only permitted to buy houses from new housing development projects, not in existing residential quarters. This job is not difficult for foreign buyers if he or she consults with a reputable property agent such as Savills or Collier. Fourth, foreigners should make sure that the property developers they are contracted with are qualified to sign housing sale and purchase agreements with buyers. In principle, the property developers are allowed to enter into housing sale and purchase agreements once (i) the housing project is properly approved; (ii) the foundation work of the house is completed, and (iii) the terms and conditions of the agreement for selling a condo have been registered at the Vietnam Competition Authority (under the Ministry of Trade and Industry). An agreement may be void if failing to meet one of these conditions, and thus, the interests of the buyer may not be properly protected. Fifth, buyers should pay careful attention to the implementation of a housing sale agreement with housing development projects, since this may be not similar to the transaction practice in the buyer’s native country. For example, in Vietnam the housing developers usually do not give notice to the buyer making payments under the contract, and so it is the obligation of the buyer to follow the payment schedule as contracted. This ambiguity may lead to late payments by the buyers, which may result in late payment penalties and/or early termination of contract by the seller (housing developer). Buyers may seek advice from lawyers to avoid such risks. Sixth, according to the Housing Law, foreign housing owners have the same full rights as Vietnamese over the house, such as the right to lease, donate, make a capital contribution, or bequest to others, etc. However, it should be noted that the foreign owner can exercise these rights only after he or she has obtained a “land use right certificate and/or property ownership” for the real estate. Therefore, in the respective contract, the obligation to apply for the certificate of ownership and/or the land use rights by the seller should be clearly stipulated. Also, when leasing the real estate, the foreigner owners must register the lease agreements with the local government (district-level administration committees), and properly declare his/her income tax for the earned rents. By complying with these requirements, the foreign buyers’ incomes will be treated as legitimate income which can be remitted abroad. In addition, when renting out a house, it is also required that the owners must register the temporary residence of tenants with relevant local authorities. Currently, it is still not clear how foreigners, as home-owners, carry out this registration procedure. Some foreigners are afraid that if they do not regularly live in Vietnam, they cannot fulfil this obligation. Actually, this difficult task may become easier if the foreign owners can engage a real estate management company to take care of this, and on behalf of the foreign owners, perform the management and administrative procedures involved. Seventh, if the foreign owners no longer want to own the house, what can they do? Can they sell it to other foreigners or Vietnamese? Yes, they can, according to the Housing Law. However, currently there is no clear guidance from the State Bank of Vietnam on how foreign owners can remit the sale proceeds from selling the house. However, my opinion is that if they can prove the money that they used to buy the house is from legal sources and relevant taxes have been fully paid, he or she is surely permitted to transfer their gains abroad. Again, to navigate through such procedures, buyers should consult with a lawyer specialising in real estate.